A charming and whimsical cabaret in English, French, and Cree for all audiences. 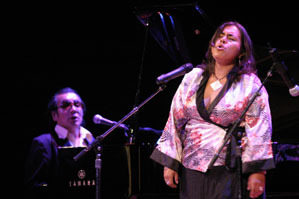 Featuring the incredible Tomson Highway on piano, the incomparable mezzo soprano Patricia Cano, and saxophonist extraordinaire Uli Kempendorff from Berlin. This cabaret will feature selections from The Incredible Adventures of Mary Jane Mosquito and selections from Highway´s musical, Rose, part of his "Rez" cycle. Five aspiring performers learn more about theatre and music in terms of breaking down scripts and examining elements of music. This mentorship with accomplished director and professor at York University, Mark Wilson, includes sneak previews, behind the scenes work, and performances of renowned Tomson Highway (playwright, composer, lyricist, pianist) and Patricia Cano (mezzo soprano/actress) and Uli Kempendorf (saxophonist) in Tomson Flies with a Little Help from his Friends. (1) Pre-Show Chat with Artistic Director Sandra Laronde with Aboriginal youth from the Urban Aboriginal Alternative High School and Wabano Health Centre. Dance workshop with Grade 9 students at York School. Many Aboriginal women prevail over unimaginable odds to achieve success and to thrive. Success comes in many forms - “Aboriginal Women – Journeys” introduces audiences to three outstanding women and features Artistic Director Sandra Laronde. Red Sky's Artistic Director Sandra Laronde appears at the University of Toronto's Distinguished Lectures Series. She lectures on Contemporary Indigenous Performance in Canada. Co-Sponsored by the Aboriginal Studies Program and the First Nations House, University of Toronto. Red Sky music and dance workshop with the Music Department at the Second Northwest University of Nationalities. Red Sky dance workshop at the Sichuan Arts Professional School. Red Sky's Artistic Director Sandra Laronde speaks on the creative process at the Arts Institute of the Southwest University for Nationalities.